Fertilizer is often misunderstood and misused. Fertilizer is not “food.” Plants produce their own food in the form of sugars through photosynthesis. The minerals or nutrients supplied by fertilizer provide the ingredients needed for photosynthesis and growth. When minerals are lacking or absent in the soil, fertilizer can be added to maintain an adequate supply. Fertilizer should not be considered a cure for ailing plants when unadapted or unhealthy plants are chosen, carelessly planted or improperly watered. When fertilizing trees and shrubs, keep these two points in mind: (1) Fertilizer is beneficial when it is needed; but (2) Use it in the right amount, at the right time and in the right place. Soil Test: Have your soil tested through the Clemson Extension Service. A soil test determines the acidity or alkalinity (pH) of the soil, along with the levels of nutrients that are present. Depending on the results, you may need to add nutrients to make up for any deficiencies in the soil. For more information on soil testing refer to the fact sheet HGIC 1652, Soil Testing. Growth: Look at shrubs and trees for signs of poor growth: poorly colored leaves (pale green to yellow); leaf size smaller than normal; earlier than normal fall coloring and leaf drop; little annual twig growth; or twig or branch dieback. These symptoms of poor growth are not always related to low levels of nutrients in the soil, nor should you assume that fertilizers would cure these problems. Heavily compacted soil; stresses induced by insects, diseases and weeds; or adverse weather conditions can cause these symptoms. Before fertilizing, determine the cause of the problem and correct it. Planting Age: Fertilizer applications in the early years of established, transplanted trees and shrubs can speed up top growth and help young trees fill their allotted space in the landscape. Slow-release fertilizers are well-suited for recently planted trees and shrubs. Location: If shrubs or trees are growing in a lawn that is regularly fertilized, there is no need to fertilize them separately. The roots of trees and shrubs will absorb some of the fertilizer applied to the lawn. However, trees and shrubs growing in planting beds may need to be fertilized, especially on sandy soils with little or no organic matter. The most commonly applied nutrients are nitrogen (N), phosphorus (P) and potassium (K). Other plant-essential nutrients used in fairly large quantities are calcium, magnesium and sulfur. It is usually unnecessary to apply magnesium and sulfur because they are generally sufficient in South Carolina soils. Micronutrients such as zinc or iron are added to many fertilizers. If your shrub or tree has a micronutrient deficiency, either apply the recommended rate of the deficient nutrient or use a fertilizer containing the micronutrient that is deficient in the soil. A complete fertilizer, such as 16-4-8, 12-6-6 or 12-4-8, is generally recommended, unless the soil test reveals that phosphorus and potassium are adequate. Two kinds of fertilizers are available: fast-release and slow-release. Fast-release or water-soluble fertilizers are less expensive than slow-release products, which release nitrogen over an extended period; however, the nutrients in a fast-release fertilizer may leach quickly through the soil. In sandy, well-drained soils, the soluble fertilizer may move past the root system after only a few inches of rainfall or irrigation. In fine-textured clay soils, leaching will be slower, but runoff may be greater. Slow- or controlled-release fertilizers have extended release periods compared to fast-release fertilizers whose nitrogen is water-soluble and readily available to the plants. The nitrogen in slow-release fertilizers may be sulfur-coated or a form such as IBDU or urea-formaldehyde. One-half or more of the total amount of nitrogen in controlled-release fertilizers should be “water insoluble” or slow-release nitrogen. For newly planted shrubs and trees, or in areas where the potential for runoff is very high, such as slopes or compacted soil, slow-release fertilizers are a good choice. Since the nutrients are released slowly, the potential for fertilizer damage (“burning”) and water contamination is less. Natural fertilizers, like composted sewage sludge, cow manure or complete fertilizer blends, provide nitrogen and other nutrients slowly. An advantage of these natural “nutrient suppliers” is that they provide minor nutrients – minerals required in small amounts such as iron or zinc – not usually found in synthetic fertilizers. Natural fertilizers also improve the soil structure. A disadvantage of natural fertilizers is that usually the concentration of nitrogen, phosphorus and potassium are lower. Therefore, a greater amount of a natural fertilizer must be applied to provide the same amount of nutrients that can be obtained with a lesser quantity from a synthetic nutrient source. Many fertilizers are formulated for use on lawn grasses. Some, known as “weed-and-feed” fertilizers, may contain a herbicide that can damage groundcovers, vines, shrubs and trees. Read the labels and carefully follow the directions. Similar to lawn fertilizer applications (HGIC 1201, Fertilizing Lawns), the recommended rates for fertilizing shrubs and trees are based on actual pounds of nitrogen. Shrubs and trees can receive 2 to 4 pounds of actual nitrogen per 1,000 square feet of root spread area per year. The root spread area occupies 1½ times the area of the crown spread (3.14 x radius²; see Figure 1). Generally, younger shrubs and trees should receive higher rates of nitrogen than mature plants. For shrubs and trees in lawns, follow the fertilizer recommendation rate and timing for the turfgrass. Depending on the formulation, applications exceeding 2 pounds of actual nitrogen can overstimulate or burn the grass. If trees or shrubs growing in fertilized lawns show nutrient-deficiency symptoms indicating a need for additional fertilizer, space the fertilizer applications a few months apart, not exceeding the total yearly amount of nitrogen required by your lawn grass (follow the rate and timing for the lawn grass). Avoid adding too much fertilizer which can harm the plant and the environment. Excessive fertilizer produces rank, weak growth that breaks easily and is susceptible to injury from cold, drought and pests. Also, fertilizer not absorbed by the plant roots may contaminate groundwater and surface water. Plants may be fertilized by either indirect or direct methods. With either method, apply the fertilizer to the entire root zone area. Because of the naturally high oxygen concentrations near the soil surface, a plant’s principal feeding roots are usually within the top 10 to 14 inches of soil. Many roots of mulched plants are located just beneath the mulch on the soil surface. Apply fertilizer to the surface of the soil or mulch; rainfall or irrigation water will carry it to the roots. Whatever fertilizer or method of application you choose, irrigate soon after you apply fertilizers to wash any fertilizer from the leaves and to help nutrients dissolve and penetrate through the mulch and soil to the roots. Without irrigation or rainfall, some of the nitrogen applied may evaporate and be lost to the atmosphere without benefiting the plants. Indirect Fertilization: Shrubs and trees growing in lawns are fertilized indirectly when the lawn is fertilized. Direct Fertilization: The cheapest and most effective method of directly fertilizing trees and shrubs is broadcasting. Using a cyclone or drop-type spreader, scatter a prescribed amount of fertilizer over the entire root zone area. To obtain the best coverage, split the total amount of fertilizer to be applied in half. Apply one-half of the total amount in one direction and the other half in a direction perpendicular to the first for excellent coverage. When fertilizing over the top of shrubs and groundcovers, make certain the leaves are dry and use a leaf rake or broom to brush fertilizer off the leaves and onto the ground after application. Some plants, like liriope and azaleas, can collect fertilizer granules in the whorls of their leaves and injury may result. If the soil in a lawn is compacted, aerate the soil, then fertilize. Watering the fertilizer in afterwards will reduce the chances for injuring any groundcover or lawn grasses. Fertilizer can be applied in liquid form to the leaves of shrubs and trees. Liquid application is commonly used to correct micronutrient deficiencies such as iron chlorosis or yellowing in azaleas (the youngest leaves are yellow leaves with green veins). Foliar applications provide a temporary solution that controls deficiencies in existing leaves with best results achieved in the spring. However, applying fertilizer to the leaves will not cure the real reason for the micronutrient deficiency, which can be the result of an improper soil pH. To find the underlying problem, refer to the soil test. If the pH will not be corrected, then the foliar application will have to be repeated. A liquid or dissolved dry formulation of fertilizer can also be applied in the irrigation water. This practice will place nutrients in the upper soil surface where most of the absorbing roots are located. Use care to get even coverage and the proper dilution rate. A backflow preventer should be installed on the irrigation system. Apply fertilizer when plants need it and when they can readily absorb the nutrients with their roots. Time your application to coincide with active root growth and adequate soil moisture. Trees and shrubs should be fertilized in early spring, and a light fertilizer application can be made in early summer if conditions are conducive to plant growth (that is, reasonable temperatures and soil moisture). Avoid fertilizing trees and shrubs stressed by drought during the summer months. If water is unavailable, do not fertilize at all because plants will be unable to absorb the nutrients. For shrubs and trees in lawns, apply the fertilizer at the appropriate time and rate for the turfgrass. Always be sure that adequate moisture (supplied by either rainfall or irrigation) is available. For fertilizer instructions for new plantings of shrubs and trees, see the fact sheets, HGIC 1052, Planting Shrubs Correctly and HGIC 1001, Planting Trees Correctly. Shrubs and trees growing in lawns should be fertilized at the appropriate time and rate for the turfgrass (see Amount of Fertilizer to Apply section). When trees and shrubs are growing in beds or natural areas, you need to calculate the amount of fertilizer needed. Figure 1. Apply fertilizer evenly on mulched and unmulched surfaces out to about 1½ times the crown radius. Trees: Apply the fertilizer to the area occupied by the tree’s roots or root zone area. The root zone area is roughly a circular area with the tree in the center. The root zone area extends beyond the drip line or outermost branches of the tree with the roots extending 1½ times the distance from the trunk to the drip line or outermost branches (see Figure 1). For example, if the distance from the trunk of your tree to the drip line, which is called the crown radius, is 8 feet, the “feeder” or mineral-absorbing roots can extend an additional 4 feet beyond the drip line. So, the root zone area can occupy an area up to 12 feet away from the trunk. Tree cultivars that have a narrow canopy, such as Fastigiata English oak (Quercus robur ‘Fastigiata’) or columnar Japanese pagoda tree (Sophora japonica ‘Columnaris’), or trees with small canopies, or trees that were pruned into unusual shapes, have a root zone area that can be much more than the drip line. In these cases, make your fertilizer calculation based on the trunk diameter. Measure the diameter in inches at 4.5 feet above the soil level (dbh) and multiply it by either 1 or 1.5 to get a number expressed in feet. This number will be used as the radius measurement for the fertilization area. 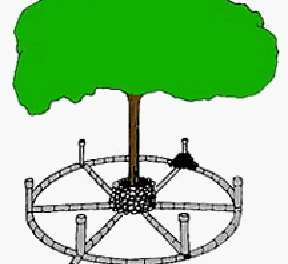 For example, the radius of the fertilization area of a 12 inch diameter tree would be 12 to 18 feet, depending on the multiplication factor that was used. Apply 5.65 pounds (about 11 to 12 cups; 2 cups of 16-4-8 is equivalent to 1 pound) of 16-4-8 evenly over the root zone area. Since most of a tree’s roots can be found in the top foot of soil, broadcast the fertilizer evenly with a rotary or drop-type spreader over the root zone area to fertilize the tree. Water after application to make the nutrients available to the roots. If the tree’s root zone area is confined by a sidewalk or driveway, reduce the root zone area accordingly. Let’s assume the bed is 30 feet long and 10 feet wide. The bed (root zone) area is 300 square feet. Apply 3.75 pounds (about 7 or 8 cups) of 16-4-8 evenly over the mulched bed. Sweep fertilizer off the branches and water afterwards to make the nutrients available to the roots. If the shrub’s root zone area is confined by a sidewalk or driveway, reduce the root zone area accordingly.